Check The Cloud To 'See' Obama's Oval Office Address : It's All Politics The words the president chose to emphasize included "oil," of course. But "clean", "drilling" and "industry" were prominent too. While Ken and Talk of the Nation's Neal Conan prepare for this afternoon's broadcast from the studios of New Hampshire Public Radio, here's a bit of a visual diversion to occupy our time. 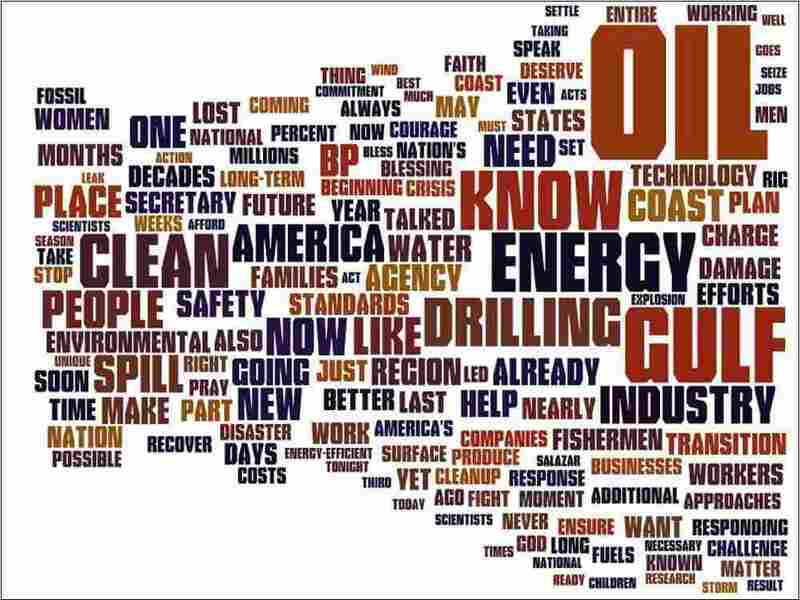 Courtesy of Wordle.net, it's a "word cloud" of President Barack Obama's Tuesday night address to the nation from the Oval Office. It gives a visual sense of the words he chose to emphasize when speaking about the oil spill crisis in the Gulf of Mexico and his hope that the nation will someday be much less dependent on oil. One thing that stands out: "BP" did not dominate.